You’ll be pleased to learn that today’s instruments are smaller, more comfortable and provide a more natural sound quality. Your audiologist will help you decide which hearing aid style is right for you based on your specific needs and preferences. Available hearing aid styles include: receiver-in-the-canal, open fit, behind-the-ear, completely-in-the-canal, in-the-canal, in-the-ear, and extended wear devices. A BTE hearing aid is curved to match the contour of the ear and rests directly behind the ear. A tube connects the hearing aid portion to an earmold, which is custom fit to your ear canal. 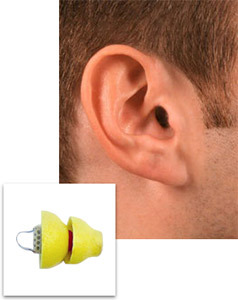 This type of hearing aid is appropriate for people of all ages and is powerful enough for all types of hearing loss. A RIC hearing aid is a variation of the behind-the-ear hearing aid. A thin wire, rather than tubing, connects the piece that sits behind the ear and in the ear. This style keeps the ear canal open, allowing low-frequency sounds to enter the ear naturally and high-frequency sounds to be amplified through the hearing aid. 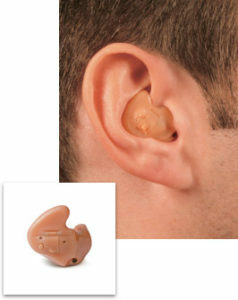 It’s a small and discreet style of hearing aid but powerful enough for treating mild to moderately-severe hearing loss. 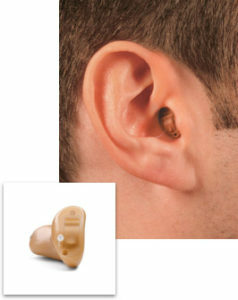 This hearing aid style is designed to fill the outer portion of the ear and is larger than those worn in the ear canals. It is less discreet, but the size allows for more features, larger batteries and makes the unit easier to insert and remove. Those with mild to severe hearing loss can benefit from this style. The ITC hearing aid style is designed to fit partly in the ear canal, but not as deeply as a CIC device, resting securely in the lower portion instead. Due to it being slightly larger than a CIC hearing aid, it is easier to insert and remove and its battery life is longer. This style is best for patients with mild to moderately-severe hearing loss. A CIC hearing aid is molded to fit deep inside your ear canal and is the smallest style available. 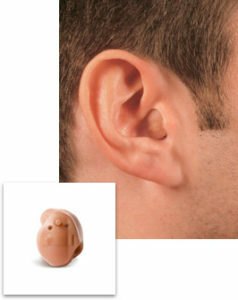 It takes advantage of the ear’s natural ability to collect sound and it’s small discreet size makes the device virtually invisible to others. This style may be a good choice for mild to moderately-severe hearing loss. 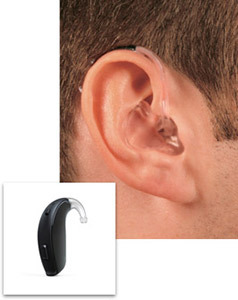 The open-fit hearing aid is a smaller version of the BTE hearing aid. Like the BTE style, it rests behind the ear and uses a thin transparent tube to deliver sound to the ear canal through a small earpiece. This style keeps the ear canal open, allowing low-frequency sounds to enter the ear naturally and high-frequency sounds to be amplified through the hearing aid. 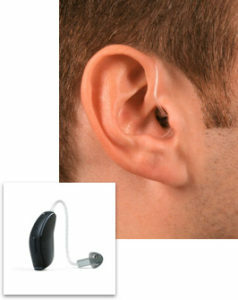 It’s a small and discreet style of hearing aid but powerful enough for treating mild to moderately-severe hearing loss. A recent innovation in hearing aids is the development of an extended wear device, called Lyric. This device is placed deep in the ear canal and designed to stay in place for anywhere from one to three months at a time without removal. Because Lyric is positioned so close to the eardrum, extended wear hearing aids offer improved sound directionality and reduced feedback, and their design prevents damage from moisture and earwax. These are particularly appealing to those with active lifestyles and can be worn while showering, exercising and sleeping. They are completely invisible to others. Despite these advantages, they may not fit all ears, and may cause some discomfort for certain patients. Lyric extended wear hearing aids are designed for mild to moderately severe hearing loss.